A special exhibition bringing together a handful of unconventional and often ingenious outsider artists is coming to Reed Projects gallery. The title Love is a Dog from Hell is taken from a Charles Bukowski poem which provides a somewhat depressive and nihilistic outlook on life and love, done in the writer’s signature style. Scheduled for showing during the Valentine’s day, the group exhibition will display a variety of works by some of the most prominent contemporary artists, as well as those of the newer names on the rise in the street, urban and contemporary scene. 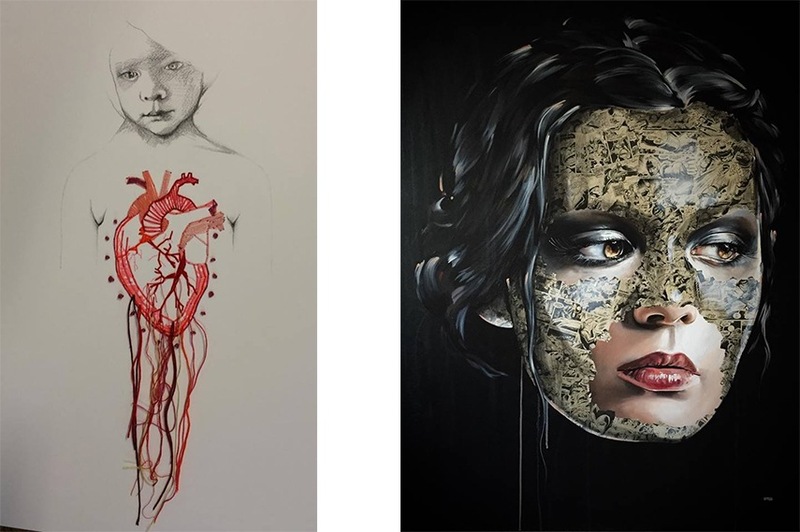 Dolk, Roald Sivertsen, Sandra Chevrier, Jeremy Geddes, D*Face, Line Osmundsen, Pure Evil, and Kirsten Opstad are just some of the names making up the roster for this amazing show, and even more are to be announced. 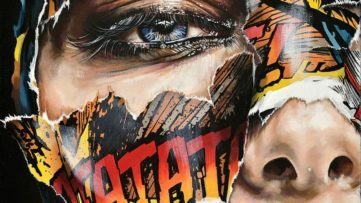 A full time single mom and a prolific artist, with that by itself worth the admiration, Sandra Chevrier explores the fluctuating emotional enigmas and concepts of our modern communication. She uses art not only to express the beauty and the tragedy that surrounds her, but as a language of its own. Sandra effectively escapes being pigeonholed in one style or another, always leaving room for experimenting and discovering new mediums, techniques and styles. Coming from London is the world-famous multidisciplinary street artist known as D*Face. The “in your face” approach he has chosen with his provocative and shocking characters seems to be working, since the artist has made quite a successful career. The instantly recognizable work of D*Face is consisted of pop imagery mixed with a clear critique of the consumerism culture of the contemporary society. His dysfunctional characters provide a judgmental commentary on our bizarre fascination with celebrity culture, fame, consumerism and materialism.Line Osmundsen draws inspiration for her work from urban club culture and its opposite – the country lifestyle. Balancing between the two juxtaposed lifestyles, she allows both to flow through her as she attempts to envision them on canvas. 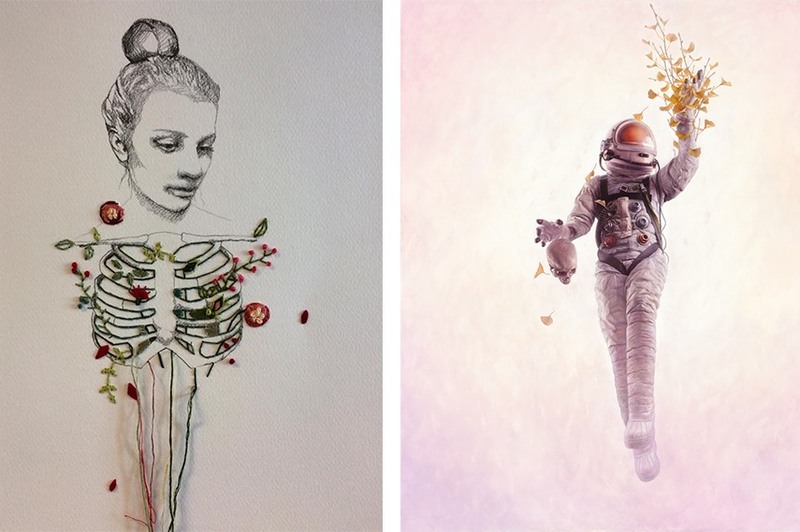 Line also reveals the feminine side in her artwork as well, symbols of beauty presented in a female form linger in ethereal and surreal surroundings. 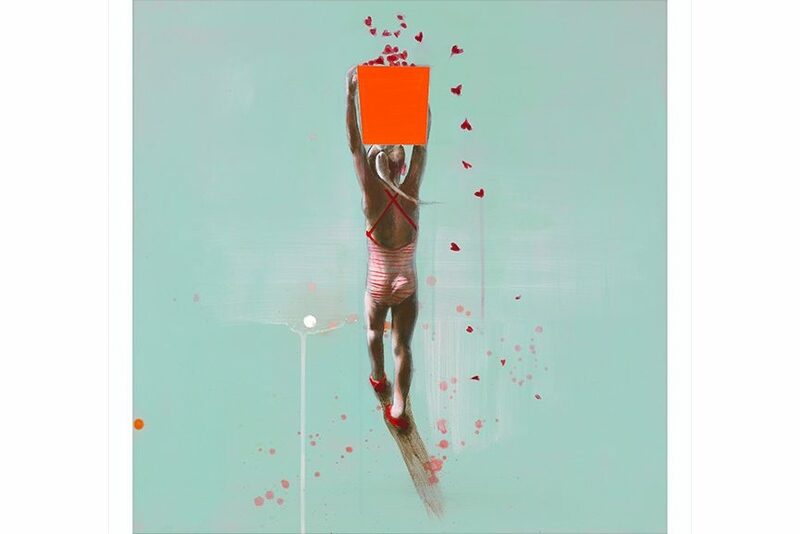 Her new print work Bucket of Love is to be released on the opening night of the exhibition. Floating cosmonauts in stark landscapes done in a photorealistic style? Yes, that would surely be the work of the Australian artist Jeremy Geddes. People colliding, floating, drifting and falling in bare and empty landscapes really do evoke a strange sense of anxiety, however, the characters are usually depicted in a state of serenity and peacefulness. With extreme attention to details, as is the practice of photorealism, Geddes spends several months to finish one piece, resulting in an astonishingly accurate and intricate image which blurs the line between the real and the surreal. Kirsten Opstad and Roald Sivertsen collaborated before in a residency program back in 2008, when the two artists brought together two widely different approaches to portrait painting. Both of them originate from Norway and even though they have worked together, their styles are quite different. Kirsten uses a naivistic approach to her drawings, while Roald practices the classical oil technique in his work. Sivertsen has received a degree in classical figurative painting from The Florence Academy of Art in Italy, and he passionately pursues this style in his work which will be on show at the exhibition at the Reed Projects gallery. 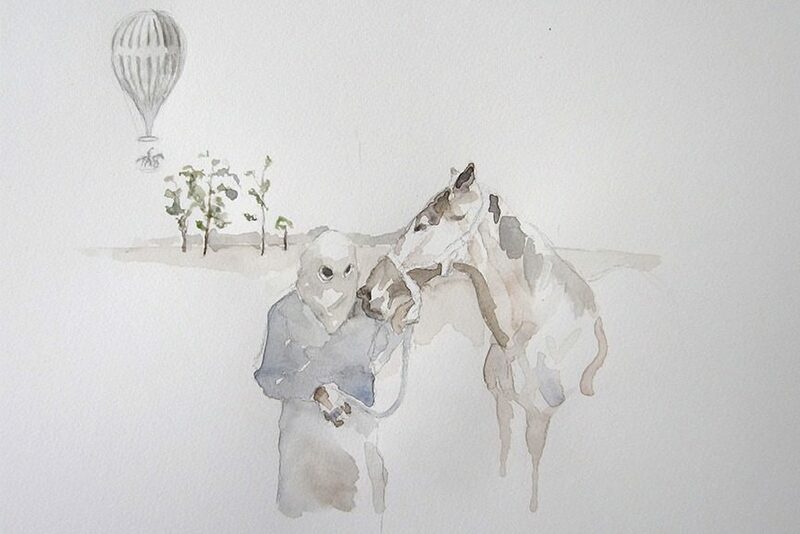 Opstad works as a contemporary artist in a variety of media such as installation, photo, sculpture, text and painting, and she often offers a mixture of these in exhibitions. Kirsten received her training at the Oslo Academy of Fine Arts. Another artist hailing from Norway, Dolk Lundgren, or simply Dolk, is primarily a graffiti artist who gained massive popularity quite rapidly. 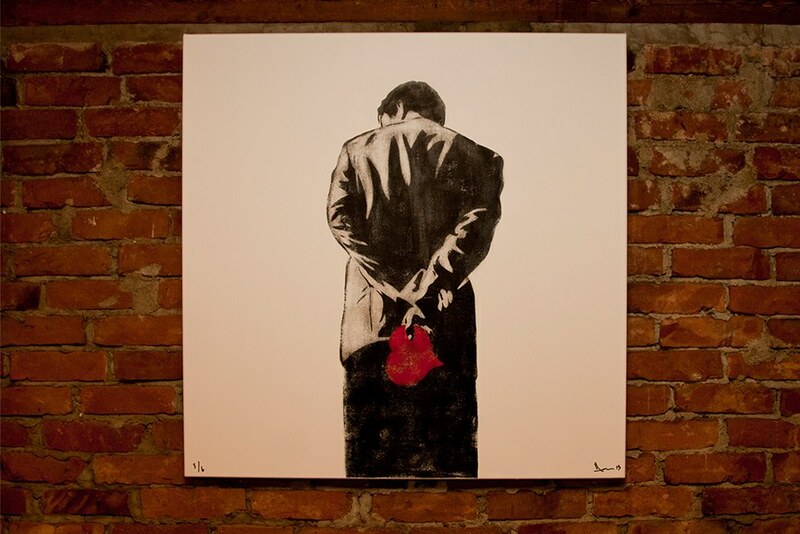 Pop-cultural references embossed in a humoristic or critical context have sometimes made people confuse Dolk’s work with Banksy’s, which comes naturally as the artist claims he was inspired by the British street art superstar. Dolk have made stencil art visible all across the globe, from Berlin, Copenhagen, and London, to Stockholm, Melbourne, Lisboa, and many other cities. 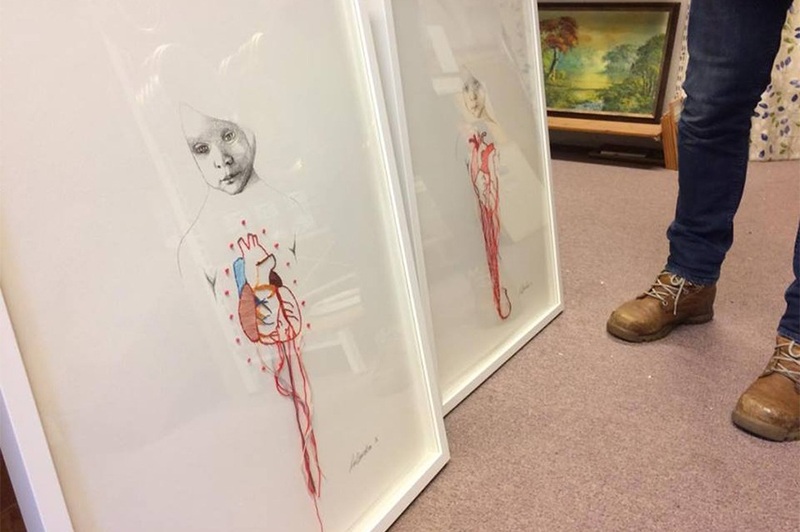 His art has been included in numerous art festivals throughout the world, and now it comes to Reed Projects gallery as part of the Love is a Dog from Hell exhibition. Descendant of Sir Thomas More, the Lord Chancellor who wrote the controversial work Utopia and who was later beheaded by King Henry VIII, Charles Uzzell-Edwards is better known by his pseudonym Pure Evil. The British graffiti artist does not even try to be subtle about his work, instead, he wishes to make people look as he welcomes the conflict. Heavily inspired by the skate culture and graffiti artists from the west coast, Pure Evil developed a truly unique style of street art, with his works almost always leaning towards the dark side of the emotional spectrum. In 2007, he opened the Pure Evil Gallery in Shoreditch, East London. As the show was announced, it is the alternative for punks, pirates, poets, poor people, drunks, taggers, clubbers, queers, artists, loners, wolves, outsiders, ravens, robbers, lovers, fighters and…friends. Even if you do not consider yourself as one of these, surely the amazing group exhibition will offer at least something of interest for everyone and anyone who is welcome to the show. Love is a Dog from Hell group exhibition is on view February 4 – March 4, 2016, at Reed Projects Gallery in Stavanger, Norway. 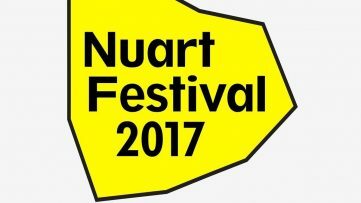 With such an amazing and intriguing roster of artists, the show is a must-see. Reed Projects Gallery continues its mission of contributing to a sense of ‘’shared values’’ and engaging the community in a creative and artistic discussion by bringing together and displaying a wide variety of different creators and artists from all around the world. More names are to be announced for this show, so keep an eye out and grab a chance to see their work at the exhibit! Sandra Chevrier Presents her Cages at Galerie C.O.A. 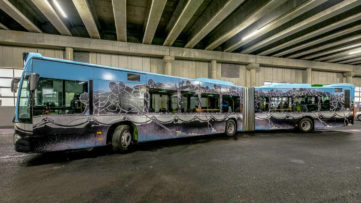 M-City Transforms a Bus in Norway to Raise Awareness on Refugees!